This is the concluding and most important in a trilogy of posts about why dark matter is probably real, but might not be. In part one we looked at how dark matter may be important for forming galaxies, but might not be, and in part two we saw how there's absolutely no compelling philosophical reason to prefer dark matter to its main alternative explanation, modifying gravity. While we saw a few examples in part one, in this post I want to take a more detailed look at the arguments against dark matter. While I tend toward the view that it does exist, let's not pretend that it doesn't have problems. And I find it very strange indeed when people claim that rival theories can't be correct because of their problems, knowing full well that the dark matter paradigm is hardly without difficulties. What I'm aiming to show is why I think dark matter is the best explanation, but not yet beyond reasonable doubt, as well as some of the successes and failures of the main alternative : "MOND" (or Modified Newtonian Dynamics, though this is really just one of several proposed modifications of gravity). 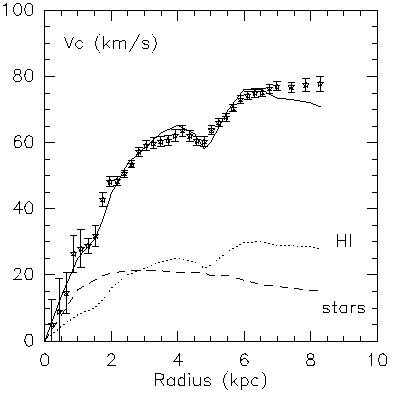 Dark matter halos always seem to be setup just so as to make the rotation curves of galaxies flat, which is a bit weird. Why don't they come in a wider variety of shapes ? Actually I'm not at all convinced this a problem because curves aren't always truly flat. Often they are, but sometimes they're weakly declining or even always rising. Neither MOND not dark matter have any problems explaining the shape of the rotation curves. Their flatness is only a problem for dark matter if you really think they're surprisingly flat, which I don't. No more surprising than a surprise birthday party, at any rate... unless you're the kind of person who forgets their own birthday, in which case cosmology is not for you. Much more interestingly, rotation curves aren't smooth. I've heard the claim previously that MOND predicts these wiggles very well, whereas dark matter doesn't. But I'd only seen curves with small wiggles in them, and as an observer I know only too damn well not to trust error bars too much. As a rule of thumb, double the size of the error bars and you're closer to reality. So itty-bitty wiggles like these aren't very interesting. What the hell is that ? The curve goes down and then back up again ? But dark matter halos are supposed to be smooth. The height of the curve should tell you how much mass is within that particular radius. 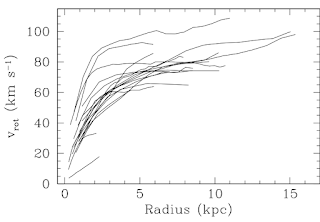 If dark matter density is smoothly decreasing with radius, how can the curve drop ? But let's not get too excited. Remember we probably shouldn't trust those teeny-weeny error bars too much. It's almost always better to get repeat observations - not because the rotation curve itself changes with time (that takes tens of millions of years), but because instruments get better. Here's a rotation curve from twenty years later of the same galaxy. From Stacy McGaugh's MOND pages. Quite different, isn't it ? Instead of a distinct dip, the curve now flattens off before rising again. The difference, in my opinion, is quite worrying. What might we find with the next set of observations ? True, MOND fits the data very well - so it should, because the MOND fit relies on the density profile. 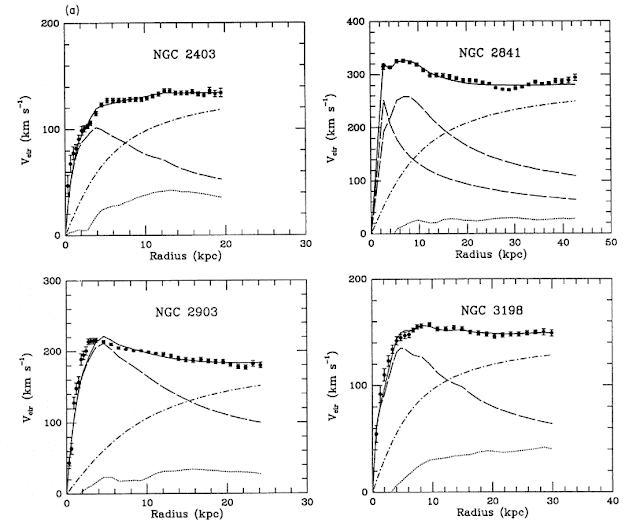 Assuming, though, that this curve is accurate, is it really good evidence against dark matter ? Weeeell... it's intriguing. You might wonder if maybe this galaxy is interacting (or something) that might have disturbed the motions of its stars and gas. If it is, it isn't obvious. 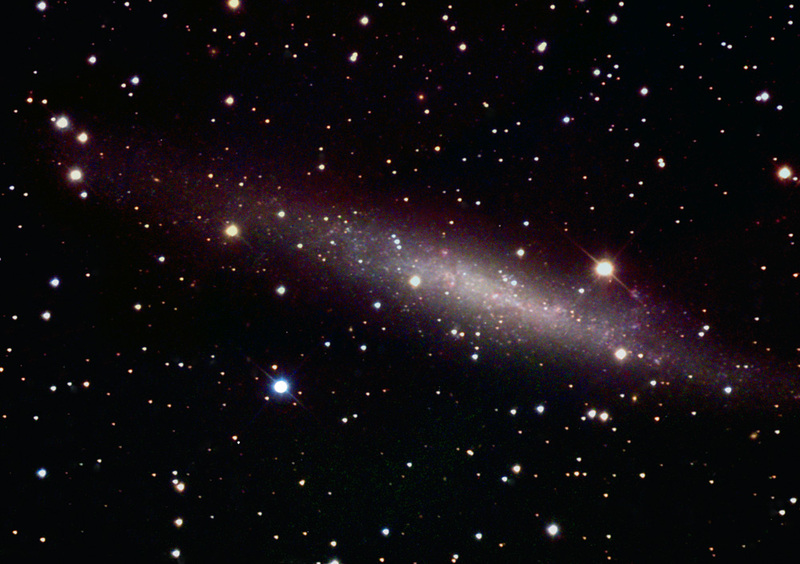 Looks like NGC 1560 is quietly minding its own business to me. 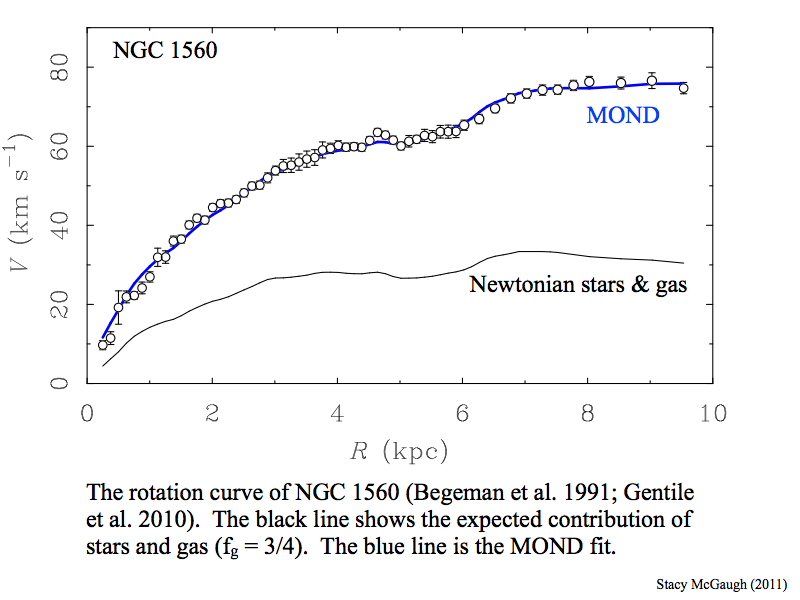 Milgrom and the other MOND supporters admitted that this is the most interesting rotation curve going against the predictions of dark matter. Personally, after seeing the later observations, I can't describe this as anything more than intriguing - certainly not great evidence against dark matter, in my opinion. Admittedly, I was rather captivated at the time, but in the cold grey light of dawn* it doesn't look nearly so interesting. * Actually the warm sticky twilight of an unpleasant summer's evening. The Tully-Fisher relation is simply an observed relation between how fast a galaxy is rotating and how massive it is. Except for galaxies which have lost a lot of gas, pretty much every galaxy - no matter how red or blue, bright or faint, big or small - obeys the same relation. From cosmoportal. "Linewidth" just means rotation speed, "I band magnitude" is basically just stellar mass. ... except that they shouldn't. It's possible to show that the surface brightness of a galaxy - how bright it is given its size - should make a difference, and low surface brightness galaxies should follow a different relation. They don't. MOND deals with this very well, and to my mind this is one of its most interesting predictions. Even if MOND is proven wrong, we should try and explain why it gets this right. Dark matter appears to be dominant over very large scales, like the entire Universe. 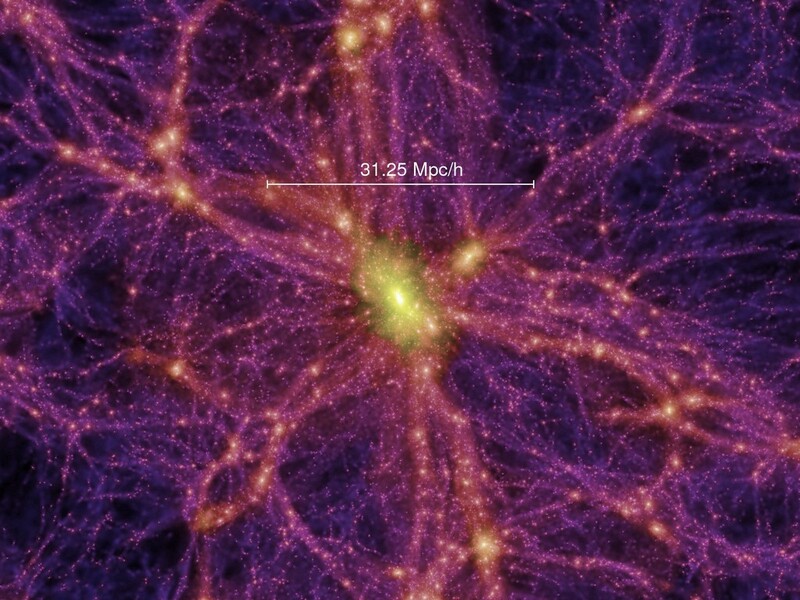 The most striking example of the success of dark matter theory is its ability to reproduce very similar structures to what we observe in the Universe in the correct time. MOND, according to Milgrom, may be able to account for this as well - possibly even produce more structure than we actually see... but that's not yet known. But as we go down to smaller scales, dark matter is less and less important, yet, paradoxically, more and more dominant. Galaxies in clusters are moving too fast, so the clusters should just fly apart without them. Similarly, individual galaxies are rotating too fast - same problem. But some galaxies are much, much smaller than others. Dark matter appears to utterly dominate the smallest galaxies... but is totally unimportant in similar-sized structures within larger galaxies. For example some globular clusters are as (or more) massive than dwarf galaxies, but don't appear to contain any dark matter (i.e. they don't have flat rotation curves). In fact most people would define a galaxy as something that contains dark matter. Now, maybe it's a bit strange that dark matter apparently dominates some tiny galaxies, but isn't present in globular clusters - but that could be down to the incredibly complex process that is galaxy formation. Yet we also don't see much (if any) evidence of dark matter when looking at motions of stars around the Sun, in contradiction to what simulations predict. It's certainly a little suspicious that dark matter appears to only affect rotation curves. On the other hand, you might wonder how such similar-looking systems with such different rotation curves can co-exist if MOND is correct. Surely gravity is gravity, so big clouds of stars should either all have flat rotation curves, or not ? As usual it's more complicated than that. MOND is nowhere near as simple as just making gravity a bit stronger or weaker (read that link, you won't regret it). Elliptical galaxies are also basically just big balls of stars, and MOND can explain their internal motions very well. But it's running into difficulties with the much smaller globular clusters, and even the MOND evangelicals admit this may be a severe problem. The results aren't yet decisive though. Just to make sure you're really confused, spiral galaxies are dominated by dark matter, having about ten times as much dark as luminous matter. Interestingly, this fraction appears to be more-or-less constant and doesn't vary depending on the brightness or colour of the spiral. Yet elliptical galaxies apparently possess little or no dark matter, despite being supposed to form from the merging of spiral galaxies ! And that's very odd indeed. 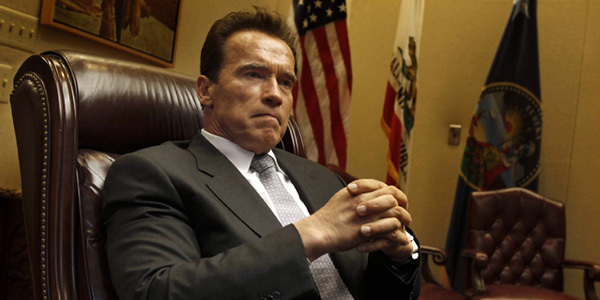 Probably, methinks, this whole "merging" business is massively over-rated. This is one of the biggest problems in cosmology today. Simulations predict many times more smaller satellite galaxies around our own Milky Way than are actually observed. Interestingly, on larger scales (like whole clusters of galaxies) this problem doesn't appear, with simulations predicting the correct number of galaxies. Could it be that the tremendously complicated gas physics has something to do with it ? Maybe. One explanation, which periodically goes in and out of favour, is that perhaps the smaller dark matter halos never accrete enough gas to form any stars at all. This idea is very much in vogue again right now, with a nearby starless gas cloud thought to require dark matter to survive its (apparent) passage through the Milky Way, a whole population of clouds discovered that could fit the bill, and complex simulations suggesting that it is indeed possible for such objects to exist. There's even an idea that by carefully examining the gas distribution, missing galaxies could be found like looking for a ship by finding its wake (perhaps explaining some of those rotation curve wiggles). But not so fast ! Even if most of these dark halos remain dark, the simulations predict that some of them are just so darn big there's no way they can avoid forming stars (the so-called "too big to fail" problem, a name I dislike). And that's worrying. Although quite popular a few years ago, practically no-one believes in giant dark galaxies any more. The latest generation of hydrogen surveys are good enough that they really should have detected them. Except for a few weird, interesting candidates, which are far too few in number to explain anything, they haven't. 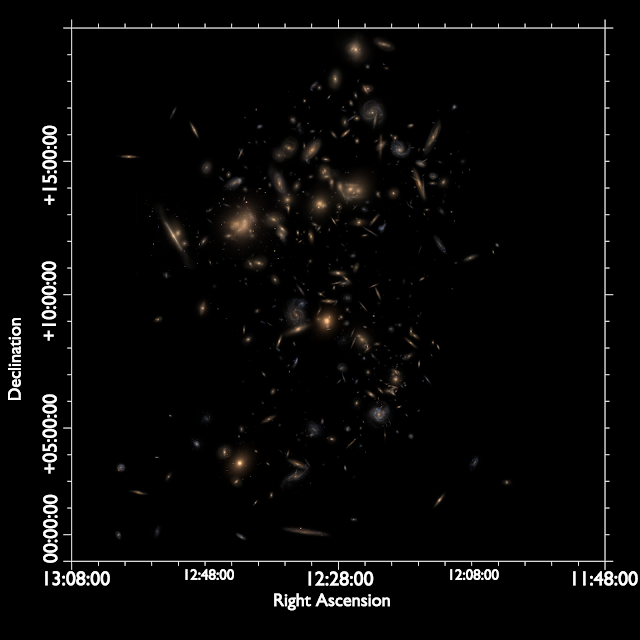 To add to the confusion, more sensitive observations have discovered more, fainter galaxies... but simulations have predicted even greater numbers of missing satellites. And there are some hints that our data analysis may be missing some surprisingly bright nearby galaxies. Nobody knows if MOND can help with this or not, because there aren't any appropriate simulations as yet. 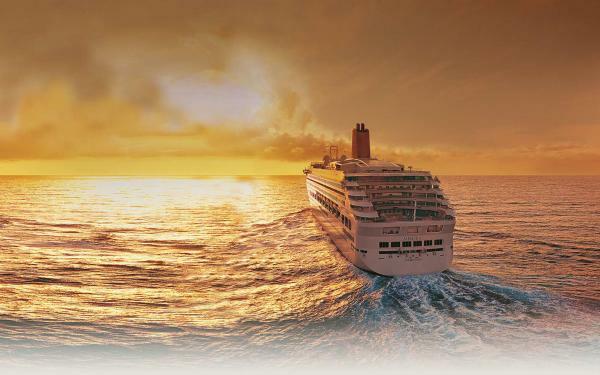 So the jury's not merely still out on this one - they've sold all their possessions and gone on a cruise around the Bahamas with some attractive celebrities, and I don't think they're coming back. Dwarf galaxies are the bad boys of the Universe. They don't let no-one tell 'em what to do. Not only are their numbers all wrong, but their orbits are just plain stupid. We saw previously that it's remarkably easy to avoid the missing satellite problem... but that simulation formed the satellites orbiting in-line with the disc, and wasn't the most orthodox approach. Regular simulations produce satellites buzzing around the larger galaxy like a swarm of bees. From the Via Lactea project. And the real ones ? They're orbiting at right-angles to the disc, which I suppose is the cosmological equivalent of giving us the finger. Is it a bird ? Is it a plane ? No, it's a Vast Polar Structure !... of satellite galaxies of the Milky Way, rendered by me. The Milky Way image is an artist's concept by Nick Risinger. The satellite galaxies are shown as spheres of arbitrary size to make them easier to see. MOND itself doesn't offer an obvious explanation to this. However one alternative explanation is that maybe hardly any of the satellites are old, primordial (left over from the formation of the Galaxy) objects, and instead they're mostly tidal dwarf galaxies. 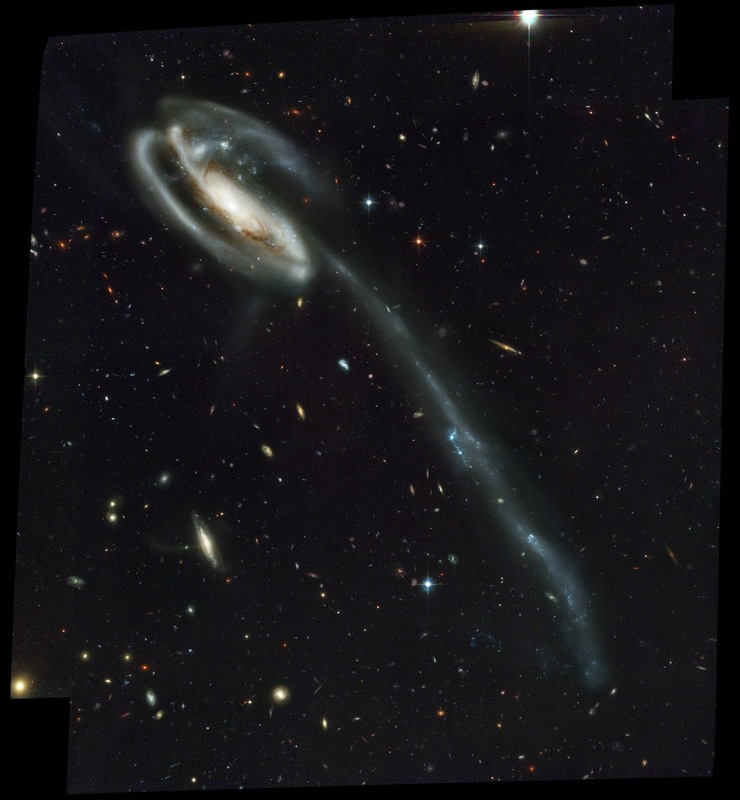 When galaxies interact with each other, they can sometimes draw out gas (sometimes a great deal of gas) into long tails. Tidal dwarf galaxies are galaxies that form in this stripped material. That would naturally explain why the Milky Way satellites are distributed in a plane and not in a cloud. Trouble is, it's much more difficult to pull material into a polar orbit than one in the same plane as the disc. Since it's spinning in the plane already, you only need to give it a bit of a boost to move the gas further out. But, perpendicular to the plane, the gas is barely moving at all, so you need to give it a lot more energy to remove it. So the question is : can you pull enough gas into a polar orbit without completely disrupting the disc of the Milky Way ? Other explanations of the planes of satellites, using entirely conventional dark matter explanations, are beginning to emerge. Some say that it's all about how you select the satellites in the simulations, and actually they predicted planes all along. Others say that it's the large-scale structure that's responsible. It's too early to tell, but having read these in depth (as well as hearing the counter-arguments against them), in my opinion it's now very unfair to say that the planes of satellites definitely contradict standard models. 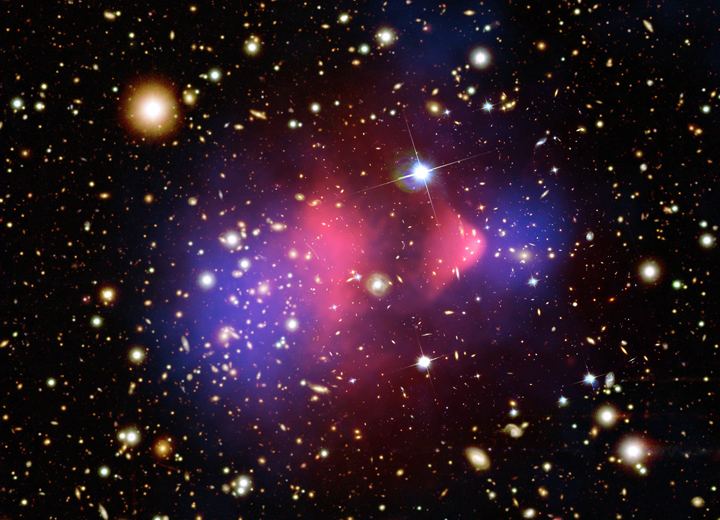 The Bullet Cluster is the poster child for how successful dark matter is. Two galaxy clusters collided, and since they're mostly empty space, they continued on their merry way, none the worse for wear. Gas in the clusters (pink) however, also collided, and since it isn't mostly empty space it got a bit stuck. Now it's found mainly between the two clusters. But the dark matter - or so the legend goes - kept going, and consequently its effects can still be seen by gravitational lensing (blue), still surrounding the galaxies in the original clusters. It's true that this result can be very neatly explained using conventional models. But, as usual, there's more to it than that. Sometimes you hear people say that the Bullet Cluster disproves MOND. It doesn't. It isn't clear what MOND predicts, because there isn't a well-established version that agrees with relativity* yet - so what is says about gravitational lensing is anyone's guess. But remember, MOND isn't as simple as making gravity weaker or stronger - the distribution of mass matters. * In MOND the speed of gravity is assumed to be infinite; relativity says this is not so. The other less-reported aspect of the cluster is that two massive galaxy clusters colliding at these speeds are predicted to be extremely rare in standard cosmology. Maybe so rare we shouldn't expect to ever detect any. But a more recent paper has found that a single Bullet Cluster is just about compatible with standard cosmology (though finding even a single other cluster like this would be a serious challenge to conventional models). Another claims (for reasons I don't understand) that's it's not a problem at all. To my mind, dark matter has the edge over modifying gravity. We know that gravity works extremely well on other scales, and we know that almost-dark particles exist. We also know that the physics of gas and star formation is frickin' complicated (and no amount of modifying gravity is going to change that), so I'm prepared to bet on "gas physics" to explain most of the current anomalies. I also have a hard time seeing any of the problems as being really serious - difficult, sure, suspicious even... but there's no single problem that makes me think, "OH, CRAP". Some people seem to see every problem as being insurmountable and that we should throw out a theory that gets even a single thing wrong. Personally I think some considerable leeway is acceptable, and we're not nearly at the point yet we should abandon anything. For me, as usual, the consensus view is the one to go with*. * Quite honestly I'm somewhat disappointed. I was genuinely hoping that in the course of researching this I'd find some much more compelling reason to doubt dark matter or favour MOND. Actually I've ended up reinforcing my own 75:25 bias in favour of dark matter, maybe even increasing it to 80:20. Maybe next time I'll pick something more controversial to discuss. But, "having the edge" does not mean, "wipe the floor with", which is what the media seems to love. If I try and be as objective as possible I can't give you a decisive result either way. 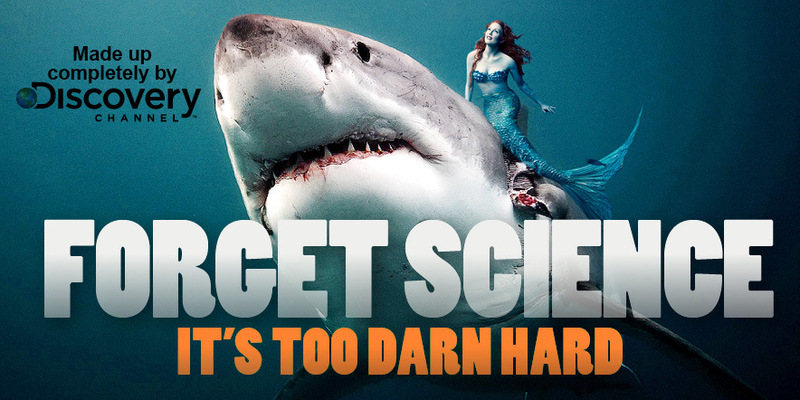 But being totally objective is not always the best way to advance science - it helps to have a goal, something to prove, an axe to grind. The trick is not to lose perspective and become so invested in that goal that you refuse to accept it when the answer isn't what you want. So I'm not going to tell you what you should believe - rather the opposite. By all means, form an opinion. Just don't be certain of it just yet. The way I see it things are progressing slowly in favour of dark matter, but it would be foolish to abandon all other possibilities right now. The day may come when the predictions of MOND fail, when we forsake modified gravity and break all bonds of... well, whatever, but it is not this day. What could a kardashev type I, type II or type III civilization build to detect dark matter/test its existence? What could modern astronomers build, given an unlimited (say, trillion-dollar) budget, to detect dark matter? A giant Ice-cube type neutrino detector using the entire surface of Ganymede? 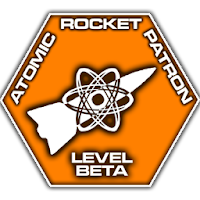 A particle accelerator running around the moon? 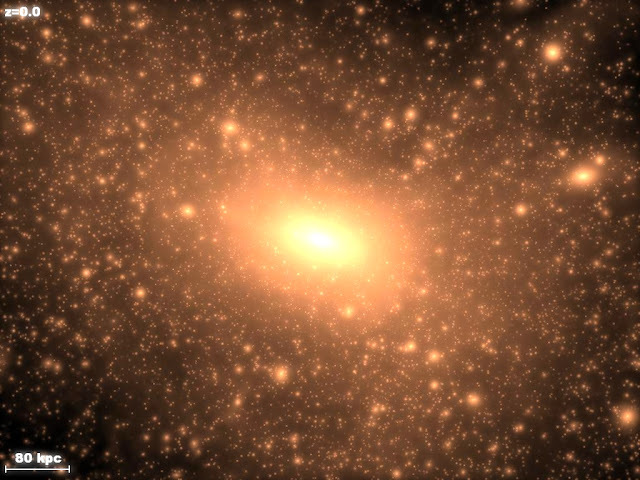 What Has Dark Matter Ever Done For Us ?